All our dreams come true if we have the courage to pursue them. I had a dream, a plan and a goal the second I decided to pursue Biomedical Engineering. My father always says, “Keep your eyes open, you never know what can inspire you”. I chose biomedical engineering to explore the fine line between technology and medical sciences. 2018 started with the exciting journey to fill the form for the Khorana Scholarship which was my target from the beginning. The deadline to fill the form was January end and the competition was tough. It was a very good opportunity to go to the USA and work in an environment where every biomedical sciences student dream to work. Receiving an email stating that I had been provisionally selected for the Khorana Scholarship 2018, was a pleasant surprise and a joyful moment but the journey had just begun. The next step was to get an acceptance from the professor of my choice and getting US visa which is a tough and a long process. I wrote to six professors working in the field of my research interest and waiting for their reply everyday was mind numbing and then I got a reply from Doctor Nitish Thakor. 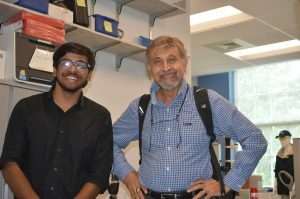 I got the chance to work in the neuro-engineering lab under the guidance of Dr. Nitish Thakor at Johns Hopkins University. I had to wait for two months to get the required document (DS2019) from my college for J2 visa and then another two weeks to get my visa approved. Patience and persistence are the key here. I wrote multiple polite emails to the respective departments to get the required documents. At the same time, I was also looking for accommodation and came across Manuj (another Khorana scholar) and we decided to rent an apartment together for which we connected to lot of people through Facebook Hopkins groups and craigslist. For a moment I was highly disappointed and thought that I will not be able to make it because my visa was not issued but I was able to stay hopeful and positive due to family and friend’s support. In the end, everything worked out and all the hard work and sleepless nights paid off and I was ready to fly to the USA. After attending the Khorana Bose orientation at the University of Chicago all the scholars headed for their colleges spread all over the country, to start their internships. We all developed good rapport with each other. 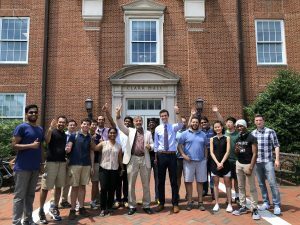 I headed to Baltimore, the place home to The JOHNS HOPKINS UNIVERSITY which is a dream college for every biomedical engineer. I got acquainted with the place and college because of Avinash, my mentor who was pursuing his masters there. He helped me in the lab by guiding me through my project and outside the lab by taking me around to good places to eat, places to enjoy, places to buy groceries and places to avoid. The lab exposure and work ethics are important things that inspired me to work harder. I got to work on technology and tools which are not available in India like Microsoft HoloLens. I developed multiple skills working in the lab, explored and worked on new technology as well as enhanced my pre-existing skills and learned about my research domain in more depth and what are the possible modifications and possibilities, which are about to come in prosthetics. The PhDs and master’s students of the lab were of great support and helped me throughout my internship. I worked during the week and enjoyed the weekend by exploring the city on foot and found out amazing places to eat from Chipotle for Mexican food to Masala Kitchen for Indian Cuisine. But Pizza Bolis and Ledo pizza were most visited. Ice creams of USA are delight for the mouth and Charmery which is close to JHU should be on your list to relish exotic ice creams. I did rent a bicycle too but did not use it much as my friends were on foot. I shared accommodation with two other Khorana and Bose scholars who also became my travel buddies. I learned to cook every day but having ready to eat curries and vacuum packed theplas (Gujrati snacks) from home made life easier. I explored Baltimore starting from ‘Downtown’ f or shopping and museum, ‘Inner harbour’ to enjoy the waterside, restaurants and city view and ‘fells point’ for entertainment and nightlife. I explored the city for two weeks and then started to go to other places. Baltimore is at a convenient distance of 1 hour from Washington and 4 hours from New York. One weekend we visited Washington and went to the white house, Lincoln Statue, Washington monument and several museums. 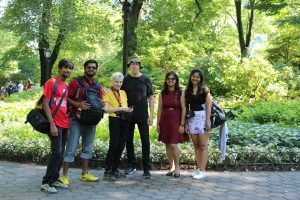 I also organized a trip with other Khorana Scholars to several places including New York city, Niagara Falls and Thousand Islands. The most astonishing city was NYC and everyone after visiting the city will say that it is a “city that never sleeps”. This scholarship gave a new spark to me and opportunities like these stimulate you to do better. 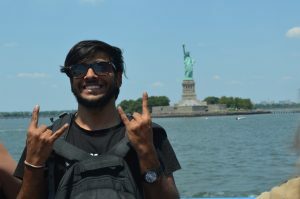 I made some good friends and came to know some awesome engineers working throughout India and in the USA during this memorable summer. Last but not the least, I am highly motivated to study further in the USA because of this exposure.